Sean Antrim: Taking into consideration that one of the reasons Vancouver is so expensive is that developers are limiting supply, which is one argument why prices are so high, what are you going to do make Vancouver an affordable place to live? Randy Helten: NSV [Neighbourhoods for a Sustainable Vancouver] has developed points and policies that answer that question, so it’s hard to answer briefly. But the simplest answer is to take corporate influence of vested interests — who will profit from land use decisions — out of the political equation, and let our democratic system function the way it should. A final outcome, with proper information in the public domain about the cost of land, the cost of development and the potential to construct without rezoning, will be more reasonable land prices, and more affordable housing. My answer is more based on principle and philosophy. When you get into the details, the day-to-day decisions that happen in committee meetings and at public hearings in City Hall would reflect that kind of philosophy based on a real democracy that is working. Where the officials are balancing all of the influence properly and with wisdom. Right now they are unable to do that. For example, council just adopted a policy that allows houses to be demolished before the developer gets a development application. This means that some of the older houses in the city, which could still serve as dwelling for many decades if restored, and which could preserve heritage, are allowed to be demolished before they’ve been reviewed and other options are examined. From our analysis at NSV, this was just opened up a few months ago. If Vision Vancouver had not done that, owners of existing houses would have to go through a bit more process before they could demolish a house. The older houses usually have lower rents. By demolishing older houses and building something brand new, the new houses are going to be selling at the top price the market can bear. A lot of these things go against housing affordability. That’s just one example. Sean Antrim: Much of the affordable housing in Vancouver is social housing. That’s how we’ve tackled the affordability problem in the past. Only right before the Olympics, with the Olympic Village, did we have the first turn away from social housing. What do you think about building social housing? Randy Helten: This gets into creative financing and creative policy. If the system is not biased in favour of profits of the campaign contributors, I think you’d get better answers. I understand that the City is Vancouver’s largest landowner. There’s a lot of land there. If some of that land was dedicated to affordable housing, not in the STIR definition of what affordability is, but in the common sense view of it being 30% or less of your income, and if the land were made available by the City on a long-term lease, that would take out a huge cost of the housing. The construction cost could in a large part be paid for through creative financing, including from the DCLs [Developmental Cost Levies] from other projects. The money from other sources through development could actually pay for the construction. You could end up with housing that is actually affordable. It could be built without profit as an investment, because it would be the City owning it. That’s one of many ways that affordable housing could be built. Sean Antrim: COPE has proposed expanding the Vancouver Public Housing Authority, which basically means the City becoming a land developer which builds affordable housing. Is that something that you would be on side with? Randy Helten: We need to have a much closer look at the COPE policy. I see that COPE has almost entirely adopted the Carnegie Community Action Project’s housing policy. We’ve just been very busy, but before the election I would like to have a look at that, and maybe we’ll endorse it too. One thing about NSV is that we are not career politicians, and we are not partisan, and we’re not depending on large campaign contributions from those who will profit from council decisions. I think we may have made history by recommending that voters vote for people from other parties. We’re looking at the individuals and their track records and not at which party they belong to. The only problem with COPE is that they’ve made deal which has guaranteed that they’re going to be ineffective on council. They can raise the issues, but if they succeed, just like in the last three years when it comes down to voting, its absolute power against everybody else. Sean Antrim: What do you think about Vancouver as a “World Class City”? Is that a priority? Randy Helten: As with George Orwell’s double speak, EcoDensity and Greenest City in the World, these can be interpreted in so many ways, as with the word “affordable.” It’s very dangerous to use the words your highly-paid spin masters have given you to try to sway public opinion. But Vancouver does have the potential to be world class in many ways. It has stunning natural beauty. Its location on the Pacific facing Asia and access point to North America, for business and for recreation and for international exchanges of culture, the fact that we have roughly the same proportion of ethnic representation as the whole world, makes it a fascinating city. The fact that we’re in a democratic, modern country, with high technology and peace, freedom of speech — although that’s being eroded by Vision Vancouver — gives us huge potential. What’s motivating me and others to act right now is especially that it is probably the most critical election in our generation. The stuff that’s been put forth over the past couple of years will be implemented. Sean Antrim: You’re talking about the Regional Growth Strategy? Randy Helten: Yes, and the transit plan and the street and structures by-law. I think the letter of that by-law, if it was enforced under a future regime, could put severe constraints on the freedom of speech. 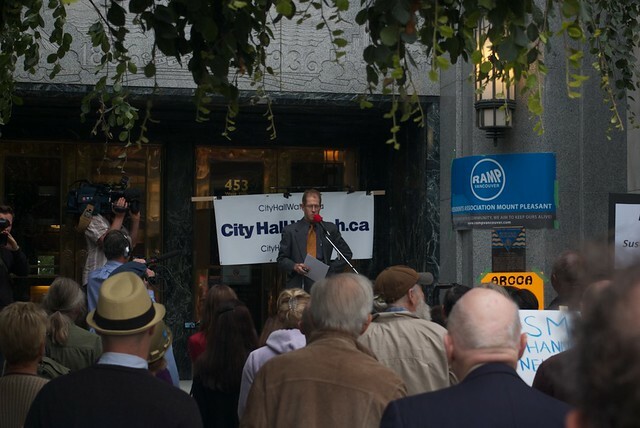 Sean Antrim: There would certainly be no Occupy Vancouver. Randy Helten: If people have to apply and pay a fee, and if the application can be rejected without clear criteria or accountability over who’s making the decision, just think about the implications. Whoever’s in majority on council could impose some very tough controls on public freedom, under the current by-law. So as a world class city, we have been given many gifts that make that possible, and there are also many dangers to that status. Sean Antrim: Many of the programs proposed right now are to decrease construction costs. I’ve asked other candidates whether or not they would be interested in decreasing land costs. This would hurt the equity of a lot of landowners. Is that something you’d be willing to do? Are land prices too high in Vancouver, and they do they have to come down for there to be affordability? Randy Helten: I think land prices are absolutely too high. This is a very sensitive topic, because it relates to people’s investments. It also relates to speculation, both from our own region, and Canada, and North America, and the World. I believe that Sandy Garossino is on to something when she talks about the role of speculation influencing land prices in Vancouver. We really think that good ideas can come from anywhere regardless of which party. Our City deserves to have a council that will listen to those ideas and not make decisions based on who’s paying their campaign costs. We’ve found that over the last few years there’s been an increase of control in the Mayor’s Office. Contract decisions are being made there without any public accountability. Is there competitive bidding being done? Are friends getting deals? There’s been an increase in the concentration of the communications department. Even the Freedom of Information manager quit. A lot of this stuff that relates to decision making and could affect land prices and land policy is not getting out there. This touches to one of my core philosophies, that if you have a system of government that is accountable and transparent, you get the best result for everyone. But when you go from a system that has systemic dysfunction like we have in the City of Vancouver and you want to make the transition to a transparent and accountable system, there could be some pain in the process. So it’s important to have a healthy transition phase. It has to be discussed carefully. Ultimately the good honest facts need to get out, but there does have to be a transition phase. Sean Antrim: How should we be funding the arts in Vancouver? The BC Liberals are cutting the arts at the provincial level. The Conservative government is cutting the arts at the federal level. They’re downloading responsibilities on to the City. Do we fund the arts in Vancouver or do you put your foot down, and make it a political issue for the province? Randy Helton: The arts, whether it’s performance or visual art, or music, is one of the highest forms of human existence. If all the other needs, such as housing, are taken care of, when everything else is done the highest aspiration is to be creative and express that. I’m not an expert on all the legislation and jurisdiction, but I think the City could do a lot to encourage the arts. The key thing is offering space for the arts. A lot of what I say is based on my own direct experience over the last two years, on the ground. For example, St. John’s Church is a very controversial development and has now been demolished under the STIR program. That building itself, even though it wasn’t recognized officially by the experts as a heritage site, was still a very precious building. It was designed as a church, so the worship area was acoustically quite nice. It had a really wonderful performance area. There were a lot of meeting rooms in it. It was about 25,000 sq ft. The building itself was only 30 years old, and we saw it come down piece by piece. It was a very solid building. That space could have been refurbished and used as an art space. The cost of that whole property was just over three million dollars. It think the City could somehow use creative financing and their influence on the large players to ensure that those kinds of places don’t get torn down, but instead continue serving the public. It would have been really cool to have something like the East Vancouver Cultural Centre. The West End could use something like that. The City could be really creative and find spaces for the arts. Sean Antrim: Why should people vote for Randy Helten on November 19th? Randy Helten: Because I have the potential to turn this City around at the fork in the road in our society. It’s the most important election in our generation. I’m not a career politician. Sean Antrim: You will be if you get elected! Randy Helten: If I get elected, my intention would be to stay for one term, to get in there and get Vancouver and our society back on a better track. To change the culture at City Hall, and make it more transparent and accountable. If we had the majority, and our colleagues working on council, I believe we could change things. Housing prices would become more affordable. We could solve the homelessness problem without partisan bickering. We would accept ideas from wherever they come from, and people would have more trust at City Hall. I also believe there would be much less time wasted and sacrificed by all of the stakeholders in our society. The developers would know the rules of the game, and they wouldn’t have to jump through hoops and make donations or lie to try to influence those who make decisions. Everybody would know the way things work, and accurate information would be out there. I think we could make this City work a lot better. Posted in Art & Culture, City Hall, Election 2011, Homelessness, Housing, Interview, Uncategorized. Bookmark the permalink. Offshore investors sending up real estate prices? What a convenient scapegoat. Try looking a little closer to home. The people buying million-dollar houses in my neighbourhood are not overseas investors. They’re people like you. P.S. Just try to defend this, Joseph Jones. I do not have seniors oriented rentals. I rent to people of all ages, mostly to younger people. In Commercial Dr. where they are located there is a lot of subsidized housing already and I support this. Is a matter of fact, I used to work for BC Housing and developed social housing all over the province. I support social housing as part of an inclusive community and do not see it as competition at all. If you are going to challenge people perhaps you could use your real name to defend your position and accusations. Such a weak and defensive comeback, Ms. Murphy. There’s plenty of affordable housing in Grandview-Woodlands, you say from your condescending former beaureaucrat’s point of view. Well, there’s not enough from my peasant, renter, I actually live here point of view. As for my real name, you can’t be serious. I’m not the one grabbing for the brass ring. You are. You are just a sideshow, anyways. It’s Ms. Benson’s million-dollar DTES speculation that is going to be NSV’s Waterloo. That just doesn`t go down well in these parts. Not even with the homesteaders – at least they live in their investments! He should know that much of this “zoned capacity” is not practical or financially viable for new development. For example, there are sites where there are multi story buildings where there could be taller buildings. Only problem is that would mean tearing down perfectly good buildings. Not particularly cost effective or environmentally sound. The other issue, is that much of this “zoned capacity” is along busy arterials. In many cases, the owners are doing just fine leasing the buildings to businesses. To tear them down to just be able to build a four story mixed use building may not be financially viable or provide affordable housing. I expect that many people don’t want to live in a four story building along a busy arterial anyway. So please, Randy and NSV, please stop spreading this myth and propose practical options for more housing in the city without cumbersome processes that will slow new housing and just make the city more expensive to the average person. @AndreaC: The house on Pender does not sit empty, it is home to 8 people. I am not one of them because I already have a place to live that is closer to my work and family. Several people are involved in the investment with my share being very small. I prefer offense to defense – and issues to ad hominem. Present levels of Vancouver “affordability” have been nurtured by the Vision-NPA axis. So keep those folk in power if you like what you have been getting for the last umpteen years, and want escalation of present trends. At the St.Andrews-Wesleyan Homeless and Housing debate, Robertson made multiple mentions of “leveraging” City-owned land with “private” partners. The Vision-dominated Council stood aside for the demolition of 224 units at Little Mountain that people could still be living in. Three acres of Far East Vancouver just got handed over to 1114 market condos – not one single unit affordable. Talk of “mix” seems only suitable for the Downtown Eastside. Even there “mix” becomes apartheid – “those others” at Woodwards being set apart in a separate tower that residents find to resemble a prison. Developers are now lusting after the 17 or so acres of public land at Britannia. Their formula is to TAKE while pretending to GIVE. Like the “market-affordable” STIR. Like the “street homeless” reduction, with the cynical count taken just ahead of shelter shutdown. Peter Weber – rents are sky-high in Strathcona. Specuvestors buy houses at ludicrous prices in this neighbourhood, take on a big mortgage, and turn around and recoup their expenses by charging exorbitant rents. Don’t think Strathcona is too expensive? Search Craigslist under “Strathcona” and you’ll see how much greedy landlords are asking for rentals (the only cheap listings are for SROs). You are not “housing” eight people. You are charging them rent to live in your million dollar heritage triplex. And if you’re like the other specuvestors who have driven rents sky high in Strathcona, you’re probably charging a pretty penny. I’ll be looking for your listing on Craigslist. It always turns my stomach when I see what “investors” want to charge for their overpriced piles. Sure, and you can be only a little bit pregnant, too. Thank you, once again, for speculating (you and your family are not investing for a loss, are they) in my neighbourhood. Thanks for helping to drive the income/rent ratio to the moon. Evil developers haven’t caused rents to skyrocket in Strathcona. But greedy, buying at bubble prices specuvestors (not overseas buyers, BTW) sure as hell have. You’re pissed about about Norquay? Guess what, I’m pissed about Strathcona, and at the enablers of this situation. It is insulting how anti-renter NSV is. Poor little homeowner Davids vs. the mean old developer/city hall goliaths. Renters are just onlookers in your crusade. They also happen to make up 50% of the Vancouver population. Greedy landlords have gotta go down in this town. As for ad hominem, yes, I’ve seen how many you’ve charmed in your Norquay crusade – you are the master, I’m merely the pupil. So has “mayor-in-waiting” Mr. Helten made up his mind yet, as of November 14, whether he can support the COPE housing platform? Is it still a “maybe”, Mr. Helten? Or is affordable housing just going to sort itself out when the developers are shown their place and thousands of private landlords can have a crack at it? So how about expanding the Vancouver Housing Authority? Earlier today in conversation I came across a wrinkle that had never occurred to me. I had always assumed that the substantial BC property transfer tax has been helping to dampen the speculation that so loves short-term buying and selling. It was said that a “wrapper” on the package — an intervening ownership layer in the form of a numbered company — makes it possible for speculators to flip around such companies without a property transfer tax affecting the transaction, because the same company continues to own the property. If this is true, loophole city! Situation exacerbated by the impossibility of following the money back to wherever it flows from. One more example of why only persons should have legal personhood — not corporations. The existing zoned capacity is extremely relevent and the city should publish those numbers before any planning processes. Ellen Woodsworth of COPE proposed a motion to that effect but it has not come forward from the Planning Department because Vision does not want that information to be public. The myth is that if we don’t upzone the entire city we will not have the supply to meet growth. That is completely false. We may choose to do some rezoning for housing variety, but there is time to plan this properly and there is no urgency to do it all at once. The current rush to rezone is causing land speculation that is forcing up property values across the city. This is working against affordability. Andrea C nobody is forcing those people to rent in Ms. Benson’s Strathcona building. Would you prefer the unaltered Strathcona of the 1960’s which was little more than a slum? If you want cheap rentals go to areas of the city like Marpole. To be perfectly honest, Andrea C.’s question, whether or not NSV will support the construction of social housing, is critical for me too. Randy didn’t commit to it, but when I interviewed him he seemed very sincere. While I for the most part agree with Elizabeth, that there are other factors to high prices, including uncertainty and speculation, I would really like to see something down on paper about social housing as reassurance. Even with promises not to eliminate social housing from the Olympic Village, Vision Vancouver cut 125 units, so I guess there’s no guarantees. We’ve seen a complete 180 from all parties except COPE. Even the NPA and members of Vision used to support building social housing. Now we only hear about market solutions, which include limiting uncertainty. Right now that’s how I’m basing my personal decision on, as I think are many others. A promise to do something, or a goal, would win me and probably thousands of other renters, over to NSV. I now have an email form Randy Helten saying they’ll endorse CCAP’s policy. I think they’re going to release a press release this morning. “CCAP’s housing policy”. Such an animal does not exist. CCAP advocates for the “10 sites” in the DTES and has brought forward two amendments to council concerning the City of Vancouver’s housing policy, neither of which were passed. CCAP is a DTES advocacy group, not the city of Vancouver. On the other hand, COPE, as a civic party, has a easily accessible and well-defined “housing platform”, which is city-wide and is not borrowed from CCAP. Mr. Helton stated above: “I see that COPE has almost entirely adopted the Carnegie Community Action Project’s housing policy.” This shows he has no idea what he is talking about. Mr. Antrim, you must be aware of the fact that such a thing as “CCAP housing policy” does not and could not exist? This is not an issue of semantics. It is a misrepresentation of both CCAP and COPE by Mr. Helton that should be be addressed. I don’t think it’s as simple as this. CCAP doesn’t have a platform, but they most certainly do have policy recommendations. COPE has included much of this in their platform. In this situation, I’m focusing my energy not at pointing out the flaws in NSV, but in pointing out the infinitely scarier and deeper flaws of the parties who are being brought into power with the millions of dollars of developer money. NSV is not perfect, but I have little fear about the candidates we’ve endorsed. Gregor Robertson and Suzanne Anton know very well what “CCAP policy” is and have openly stated they refuse to endorse it or have directly voted against it. I do think we need solid, progressives who will commit to exactly what CCAP has proposed, and to build the 10,000 units a year of social housing that has been proposed by Occupy Vancouver. If Randy gets elected and doesn’t sit down at the table with housing activists and seriously consider putting these ideas into place, I will eat my hat. If he considers it and doesn’t put it in to place, you can join me in the streets marching to City Hall! CCAP has indeed made recommendations related to housing policy. See page 5 here: http://ccapvancouver.files.wordpress.com/2010/09/ccaphotelreportweb.pdf. Ivan Drury’s 3 points in a previous article are essentially included in them. NSV did publicly support Drury’s points, plus some of CCAP’s on housing/homelessness. See media releases on http://www.nsvancouver.ca. CCAP has indeed made recommendations related to housing policy. See page 5 here: http://ccapvancouver.files.wordpress.com/2010/09/ccaphotelreportweb.pdf. They essentially include Ivan Drury’s 3 points. NSV did publicly support Drury’s points, plus some of CCAP’s on housing/homelessness. See media releases on http://www.nsvancouver.ca. After the election, we will be good for our word.